THE MDC Alliance and its partners in the civic society instigated last week's violent demonstrations so as to attract the attention and support of the international community in its failed bid "for talks" with the Government and ultimately effect an illegal regime change, political analysts have said. The MDC A has been accused of using the "fuel protests" to reignite its bid for talks with Government so that it is accommodated in a Government of National Unity. 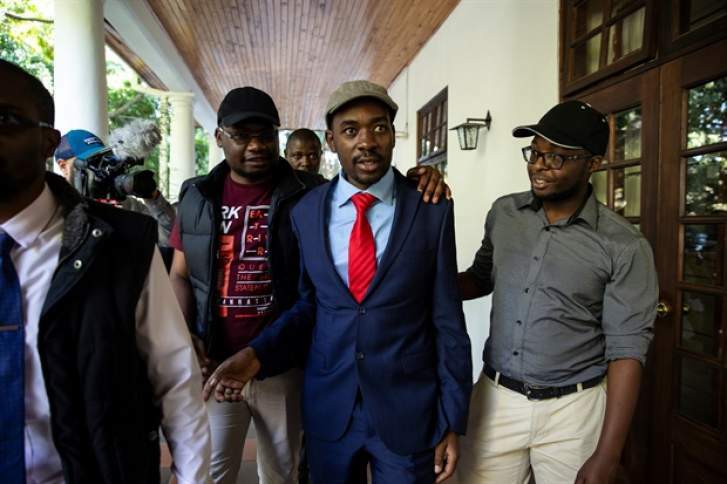 A number of MDC Alliance members and civic society members in South Africa quoted by the media across the Limpopo claimed the economic challenges that the country is facing can only be solved if Government "negotiated" with MDC A leader Mr Nelson Chamisa. They added that regional leaders should "push" the Government to a negotiation table with the opposition. "There is no solution without the MDC . . . the Government should be dragged to a negotiation table and there should be a national transitional authority in the country . . ." said one activist based in South Africa. However, political analyst Mr Richard Mahomva said such efforts would not succeed, adding that the violent protests did not benefit anyone. Another political analyst, Mr Goodwine Mureriwa, told our Harare Bureau that the violent protests point to a poorly-concealed political agenda oiled by the country's traditional foes. He said the protests had nothing to do with fuel price hikes. "The fuel issue was only manipulated as a trigger to long standing efforts to internalise domestic politics in Zimbabwe in a manner skewed in favour of MDC A." President Mnangagwa has also repeatedly said there was no room for such "talks" with the opposition as he won the Presidential election and Zanu-PF also has more than two thirds majority in parliament. In addition, Information, Publicity and Broadcasting Services Minister Hon Monica Mutsvangwa said there were threats from the opposition to overthrow a constitutionally elected Government. She added that actions by the opposition amounted to terrorism as they were marked by a total violation of the law which had nothing to do with the right of citizens to demonstrate as enshrined in section 59 of the Constitution of Zimbabwe. "Threats to overthrow a constitutionally elected Government by force or install an unelected person as President of Zimbabwe will be thwarted. It will not work . . ."
Minister Mutsvangwa added that the timing of the violence was not a coincidence, as it sought to put a dent on President Mnangagwa's re-engagement efforts during his current tour to Eurasia and the World Economic Forum in Davos, Switzerland. The ruling Zanu-PF party also said it will not hold talks with the MDC-Alliance. Zanu-PF chief whip Cde Pupurai Togarepi told the party's parliamentary caucus in Harare last week that the social media was awash with statements by MDC-Alliance functionaries like its deputy treasurer Mr Charlton Hwende threatening to unseat President Mnangagwa's Government. "There are messages on Twitter from the likes of Hwende who said they are going to remove President Mnangagwa's Government in January. So is what we are seeing a manifestation of that? . . . It is very unfortunate if what they are looking for is dialogue at the same time they are causing mayhem in the country and destroying property. I think there are many avenues they can use to create dialogue with Government, with Zanu-PF or with any other political establishment in the country . . . ," Cde Togarepi said. Minister of State for National Security Hon Owen Ncube last week said the MDC A and its allies organised the violent demonstrations. He said the protests were "well-orchestrated", given the widespread scenes of looting from shops, burning of cars, destruction of property, burning of tyres and closing of roads, which left four people dead, among them a police officer. "The prevailing security situation in the country is a culmination of a well-orchestrated series of events by the MDC Alliance, working in cahoots with NGOs, civic society, youth organisations, pressure groups and individuals," said Minister Ncube. Minister Ncube said Government was aware of meetings organised by the Crisis Coalition in Zimbabwe from 3 to 7 December last year to foment disturbances in the country. "These meetings were coordinated by Crisis Coalition and some identified foreign agents . . . There were other meetings such as the one held on 11th January 2019 in Belvedere, whose agenda was to plan for the disturbance of peace and render the country ungovernable," he said.